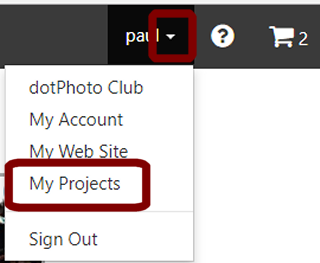 TheÂ dotphotoÂ My ProjectsÂ tool enables you to save and retrieve projects that you’re working on. This is particularly helpful when making products with multiple photos like calendars and books, or when you want to show the product to someone else before ordering. Choose My Projects. Â dotphoto presents images of your saved projects that you can tap to return to the project design. In the illustration here, you would tap the calendar to go back to the design.